A retired couple from Dallowgill, near Ripon, have been told they must pay more than £500 in council taxes after withholding it from the council. The couple have withheld their council tax for three months in response to the council refusing to pay their legal bill or offering any compensation. However, a judge ruled on Wednesday that they must repay their council tax and would be writing to them to charge for legal costs. Mr McKinley said he was expecting that he would have to repay his council tax but has vowed to carry on fighting for compensation, even if it meant jail time. He said: “The council did not accept that they had any responsibility for compensation and that it was a different department but I got the chance to give my speech on the matter. “I told the court what had happened and why I withheld my money. I never said I was not going to pay it, I just wanted to give my point of view across. They expect me to pay for their costs but I am not prepared to pay more than my council tax. 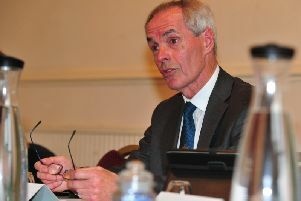 Mr Mckinley said the council’s legal expenses came to around £100 and said ‘they are not prepared to my legal costs but expect me to pay theirs’. He said: “The court agreed with the council that the two issues were separate but I think that they were sympathetic to my side. The couple had their conservatory built in 2012 after the council’s planning department confirmed planning permission was not needed. But they were later told in November 2013 by the same department that an enforcement notice had been put in place and the building had to be pulled down. After employing a solicitor the enforcement notice has been quashed after a planning inspector confirmed it had been built upon the same site as an original building. Despite placing the notice after incorrectly concluding the conservatory was a property extension, the borough council has refused to pay the couple’s legal bill or offer any compensation. A spokesman for Harrogate Borough Council said that Mr and Mrs McKinley’s son, Conan, who appealed the notice, did not make a claim for costs at the appropriate time. “The appeal against the enforcement notice was instigated by Mr and Mrs McKinley’s son and at that time he received correspondence from the Planning Inspectorate directing him to the advice pamphlet Costs awards in planning appeals,” the spokesman said. It sets out in what circumstances costs can be awarded together with how and when this must be made. But in response Conan McKinley has said the process was complex and at no point did the form make clear where to claim costs.